The March-April 2019 issue is here! 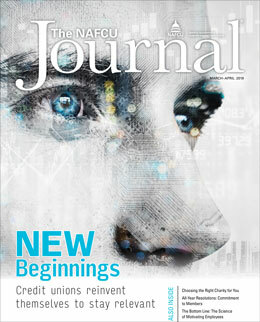 The March-April issue of NAFCU's award-winning magazine, The NAFCU Journal, is online now. Credit unions leverage core values to reinvent themselves, create staying power. Choosing the charity that’s right for you. Helping members stay on track with their New Year's financial resolutions is a year-round commitment. Subscribers get both the print edition as well as unlimited access to the digital edition and archives. Anyone can subscribe to the digital edition email (update your email subscriptions in your website account). For questions or to subscribe to The NAFCU Journal, please contact NAFCU Member Services at info@nafcu.org or 800-344-5580. Your subscription will begin once we receive payment unless this is part of your free copies with NAFCU membership. Learn about advertising opportunities with The NAFCU Journal.